“I wish to learn, will you teach me?” a man once asked the Sufi teacher Libnani. “I do not feel that you know how to learn,” answered the teacher. “Then can you teach me how to learn?” countered the man. “Can you learn how to let me teach?” was the reply. What sometimes keeps us from learning—whether from a sage, from our relationships or co-workers, or from the ups and downs of daily life—is that we don’t know how to let others teach us. We don’t know how to shut off our own mind and hear. 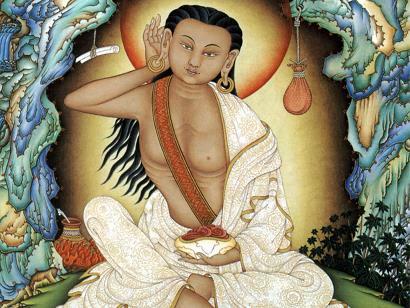 True listening is an art—one that involves what renowned physicist David Bohm called the ability to “suspend your assumptions.” Bohm worked in the field on quantum physics and was also a champion of dialogue. For him, dialogue was an application of the key quantum themes of interconnectedness and flow. Abstraction: an idea or concept that is hard to understand or is theoretical, not practical. It’s easy to talk in abstractions as we stand on our soap boxes, erupting passionately in front of the evening news or in the break room at work or at dinner with friends. It’s easy to be abstract while we’re pontificating or complaining about the latest atrocity in local or national or company politics. But do we walk our talk? Actions always speak louder than words. The effects of our actions, our behavior, our attitude—how we treat ourselves and others every day—are what tell the tale of who we are when all is said and done. That will be our memorial and the monument to our life. What good is it if we say we stand for peace or compassion yet don’t connect with others peacefully and compassionately? How can we advocate generosity if we sarcastically put down everyone who doesn’t agree with our approach to solving problems? How can we claim to have a more “enlightened” point of view when we haven’t even stepped across the aisle to listen, without prejudging, to what others are concerned about so we can find some common ground? A good question to ask yo urself: What memorial am I building and what will my monument look like? What Will Your Monument Look Like? I’ve been to London several times and seen St. Paul’s Cathedral from different vantage points, elegant amid the busy city landscape. But not until my latest trip there earlier this year did I explore the secrets inside this magnificent work of art. When you stand inside beneath the incredibly beautiful dome and look up, you cannot help but be awestruck. Christopher Wren designed the cathedral after the catastrophic 1666 fire in London that destroyed over 13,000 houses and 87 churches. The original church had been standing for one thousand years before that fire. The foundation stone for the new cathedral, a symbol of hope to the devastated city, was laid in 1675. Thirty three years later, on Wren’s 76th birthday, the final stone was laid by his son. Wren lived beyond 90 years of age and designed 51 other churches and many other noteworthy buildings in his stellar career, but St. Paul’s was his masterpiece. Oh yes. That is what gives me chills. A simple and sublime truth for all of us. Each of us has the opportunity to leave behind our “monument,” the evidence of what we have stood for. Tangible, not abstract. Beyond the chatter and bluster to what’s real. General Good is the plea of the scoundrel, hypocrite & flatterer . . . . The Infinite alone resides in Definite & Determinate Identity. Your life is your message. It will become your monument. Don’t let it be an abstraction. Through the Smoke and Flames, What Stands Tall? 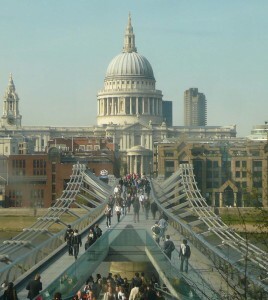 The history of St. Paul’s teaches us other lessons. One is memorialized in the famous image of St. Paul’s surrounded by smoke and fire in the 1940s. During World War II, when this photo was taken, the survival of St. Paul’s was threatened again, especially during the Blitz—eight months of sustained attacks and bombings on key cities. Churchill ordered St. Paul’s Cathedral to be saved at all costs. 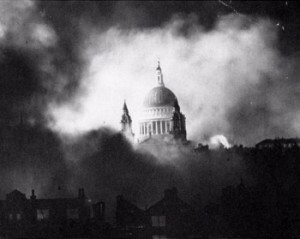 While fires raged all around the City of London, fire battalions and volunteers with hoses and sandbags worked around the clock to save the cathedral. It was hit at one point, but miraculously escaped largely untouched. Once again, St. Paul’s—standing tall midst the smoke and fire—became a symbol of hope and the nation’s resurgent spirit. This image is a wonderful analogy for our own lives. When things seem to be crumbling around us or going up in flames, there is something that remains. Look through the smoke and you will find it standing tall: your monument—what you stand for, who you truly are, your resilient spirit. Build on that to rise again. Look around yourself at those you interact with every day. What story does your life tell? What are you passionate about? What do you stand for? How does it show in what you do and who you are? Do you treat yourself and others in a way that is consistent with what you value? What will the lasting “monument” of your life look like?